First things first: a new trailer was released on September 18. Stills from this mouth-watering montage are shown throughout this page, and we’ll have some analysis down below, but first let’s jump back in time and get caught up on what’s been happening since our August 1 update. Our second report closed with a notice about a cross-promotion between the Yamato movie and the 2010 concert tour for SMAP. What’s a SMAP, you ask? Simple; it’s the pop group that includes mega-popular singer/actor Takuya Kimura, who plays Kodai in the movie. Fans who bought concert tickets (which look remarkably like Yamato movie tickets) could choose from one of two postcard sets as a free gift. There was the “Earth” version (below left) and the “Space” version (below right), both of which came with mini pocket folders that give us a good look at the new design for the EDF anchor emblem. Takuya Kimura, known to his fans as “KimTak,” has found other ways of cross-promoting the movie. He started earlier in mid-January by eating only tomatoes for three days in a “SMAP Ganbarimasu (Do Your/Our Best)” challenge, playing on the verbal similarity of Tomato and Yamato (at least in the way the Japanese pronounce it) and making various references during the show — and was visited during the challenge by none other than Isao Sasaki, singer of the original Yamato theme. Special thanks to KimTak fan Chels for providing this news nugget! The giant 3-meter-tall X 5-meter-long Yamato bow statue that formed the centerpiece of an exhibition at the 32nd World Hobby Fair in June went on the road afterward, showing up at public spaces in four cities through the end of August. The photos below were taken in a shopping mall on August 15. The first trailer and various free goodies traveled with it, and has been captured on video. See it on YouTube here. The Sanrio tie-in with the opening of advance ticket sales in early July paid off throughout the month of August when fans could see a live stage show with a Yamato theme at Puroland, Sanrio’s theme park outside of Tokyo. The show was titled Hello Kitty and Daniel Love Films!! From Space Battleship Yamato. The occasion marked the mutual 36th anniversaries of both Kitty and Yamato, both of whom were “born” in 1974. See a performance of the show on YouTube here. Puroland also hosted an exhibit of props and costumes from the film which later went on tour to other locations. One stop on this tour was visited by a Japanese blogger named “Shin” who caught them on camera and posted several photos here and here. Shin commented briefly on their strong resemblance to designs from Battlestar Galactica. 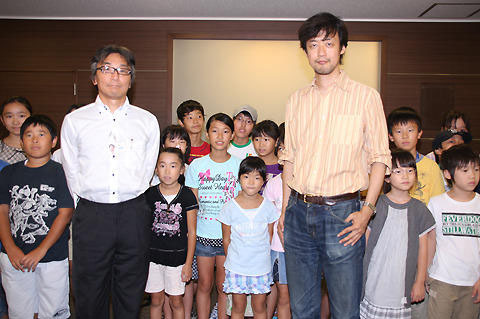 On August 18, Director Takashi Yamazaki, who is making the vintage classic SF anime Space Battleship Yamato into a live-action film for the first time, met with Professor Hitoshi Naka of JAXA [Japanese Aerospace Exploration Agency], who is engaged in development of the ion engine used on the asteroid space probe Hayabusa (Falcon). Their public conversation, which was arranged by the Ministry of Education, Culture, Sports, Science and Technology, took place at Kasumigaseki, Tokyo. In the film, Space Battleship Yamato travels 148,000 light years to the Planet Iscandar to save the Earth from radioactive pollution in the year 2199. It depicts the battles of ace pilot Susumi Kodai (Takuya Kimura) and the crew. Hayabusa explored Asteroid Itokawa, about 300 million kilometers from Earth, and returned this June after its seven-year mission. “I have only one-tenth the budget of an American film. In comparison, I’m encouraged by Hayabusa‘s safe return,” he enthused. Space Battleship Yamato opens nationwide on December 1. UPDATE: Hayabusa‘s mission was successful, only the fourth time in history that extraterrestrial matter has been brought back from space and the first time dust has been captured from an asteroid. Read about it here. One month later, a new burst of news put the movie back in the spotlight as the next phase of promotion began. When advance tickets first went on sale June 3rd with the Hello Kitty charms as a bonus gift, it was revealed that this was to be the first of two such promotions. The second began on September 18th when the bonus gift became a limited-edition two-sided “clear file,” one of those ubiquitous plastic sleeves used to (A) carry papers and (B) promote just about everything in Japan. This offer renewed interest in ticket sales and gave us our first complete look at the movie’s ship design, which bears a strong resemblance to the “1977 Yamato” painted by artist Naoyuki Katoh of Studio Nue. Interest was further ignited by the release of the new movie trailer on the same day in not just one, but two versions that each contained unique footage. Links to both can be found further down this page. Non-Japanese speakers might have wondered about the appearance of the English words “Love Lives” in the trailer, and the explanation for this made international news that very same day. 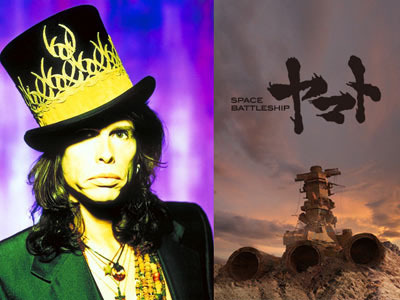 Steven Tyler, the vocalist of the American rock band Aerosmith, is singing the theme song for the live-action film version of the Space Battleship Yamato anime franchise. Tyler wrote the “Love Lives” song specifically for the film, and the single will go on sale in Japan on November 24. It is Tyler’s first solo single. After his agent received the official offer from the Yamato production staff, Tyler looked over an English translation of the script and production materials. He responded to the Yamato‘s theme of “I want to protect the ones I love” and agreed to write a song. 37-year-old SMAP band member Takuya Kimura (Howl’s Moving Castle‘s Howl) is headlining the live-action film based on the 1974-1975 space opera anime classic, Space Battleship Yamato (adapted as Star Blazers in English). The other cast members include Meisa Kuroki (Vexille – 2077 Isolation of Japan‘s Vexille, Crows Zero‘s Luca), Toshiro Yanagiba, and Tsutomu Yamazaki. Takashi Yamazaki, the director best known for Returner, Always: Sunset on Third Street, and last year’s Ballad, is helming the project for a December 1 release. As longtime fans know, the involvement of a pop/rock star is a well-worn Yamato tradition, with “insert songs” going all the way back to Kenji Sawada’s closing theme for Farewell to Yamato in 1978. But it goes without saying that Mr. Tyler is the best-known musician to accept the honor and it will finally give us one of those songs in English. Portions of Love Lives are heard in both versions of the trailer; more of it can be heard in a Japanese TV report here. Finally, now that we’ve got new footage to examine, let’s explore some of what has been revealed in the trailer itself. Here we see “ace pilot Susumu Kodai” flying his Cosmo Zero in a nose dive past some rather ominous-looking alien ships toward what may or may not be the scorched surface of Planet Earth. At first glance, the Cosmo Zero doesn’t look much like its anime counterpart, but the shape and color of the nose (in frame three) are a definite giveaway. We’ve also been given a better look at enemy ships, which are almost certainly from Gamilas. In frame 1 we see Black Tigers fleeing an explosion that is just about to consume a globular vessel seen in profile; it’s the same ship from the first trailer, now viewed from a distance. In frame 2 we see something else entirely, an elongated design that probably opens up to launch fighters and fire weapons as seen in frame 3. Yamato is bearing down on one in frame 4, trading heavy fire. Lastly, we have scenes even a casual fan can instantly recognize; Kodai powers up and fires the Wave-Motion Gun. They bear a very strong resemblance to the CG animation in 2009’s CR Yamato 2 pachinko game, which means we can expect the movie’s SFX to at least live up to that impressive standard. 1. Kodai is a former ace Cosmo Zero pilot, disillusioned with the war after he loses his brother in the Battle of Mars (not Pluto). He becomes a scrap metal collector. Working on the surface one day, he sees something crash to Earth which contains a message capsule from the far-off planet Iscandar. 2. Yuki [Nova] is the Top Gun of the Cosmo Tiger pilots, and leader of the Cosmo Tiger Squadron aboard Yamato. Kato [Conroy] is now the No. 2 Cosmo Tiger pilot, and is Kodai’s rival for Yuki’s affection. 3. Instead of leaving his parents and little brother behind, Shima is now a husband (as evidenced by the wedding ring seen in the trailers) and a father (since he is seen talking to his son). In the anime, his brother was named Jirou; this may or may not be his son’s name in the film. And speaking of the site, it got a long-overdue facelift on September 23 with a countdown-to-release clock, new art, multiple pages, a news blog with hints of new products. English-language material was added on September 30, including subtitles on the trailer. But wait, there’s more! Almost without exception, one of the first reactions to the trailers has been, “I want one of those jackets!” Apparently this request has been heard. On September 28, Dive Toys Warehouse announced the forthcoming release of these two crew jerseys, which almost resemble those in the movie. The fabric is polyester rather than leather and the waist/side stripes are new, but other than that they’re pretty darn authentic. They’ll be sold in Japan starting November 25 for something north of $150 American. Shortly after this report was initially posted on October 1, Shogakukan published the novelization of the film by author Manabu Wakui. The publication date coincided with the October 6 anniversary of the first Yamato TV series, which is usually commemorated by one product release or another (consult our various History Timelines to see how it has been marked in the past). The book easily fits into the Japanese “light novel” category, pocket-size and less than 300 pages with no interior images…but a quick glance through it reveals some interesting details. The chapter titles give a clue as to how the story is compressed: Prologue, Yamato, Meeting the Enemy, Gamilas, Iscandar, Hope, and Epilogue. A casual skimming for specific terminology reveals the words Space Colony, Shock cannon, Analyzer, Large Magellanic Cloud, Warp/warp test, Black Tiger, Cosmo Zero, Pulse Laser, Wave-Motion Gun/Engine, Space station, and all the standard character names including Dessler. There is also an altogether new one: Gamilasborg. Based on the limited information in the movie trailers, this probably refers to the skeletal creatures seen in the ground war scenes. If so, it suggests that the ground war occurs on Gamilas. Also telling is the absence of certain terms: Starsha, Domel [Lysis], Robot [relating to Analyzer], and any planet other than Earth, Gamilas, or Iscandar. It’s possible that these were simply not specified the novel so the movie could fill them in, but evidence is elusive. There is definitely a message capsule from Iscandar, but no indicator of the sender. Yuki is also the viewpoint character in the epilogue, which takes place in 2205. Full translations of both the prologue and the epilogue are included in our synopsis of the movie, which can be found here.